Three U.S. Senators are calling on Education Secretary Betsy DeVos to stop denying workplace rights and protections to nearly 4,000 Department of Education employees who are represented by the American Federation of Government Employees. They urge Education to comply with a July finding of a Federal Labor Relations Authority investigation that the department violated federal labor law by failing to bargain in good faith with AFGE and unilaterally imposing its own proposal on 3,900 federal employees represented by AFGE. "It is in the best interest of the U.S. Department of Education to have a positive and constructive working relationship with its workforce," the senators wrote. "Therefore, we urge you to return to the negotiating table to work in good faith with the employees' union to reach a fair and equitable contract, and to adhere to the 2013 collective bargaining agreement until negotiations are complete." 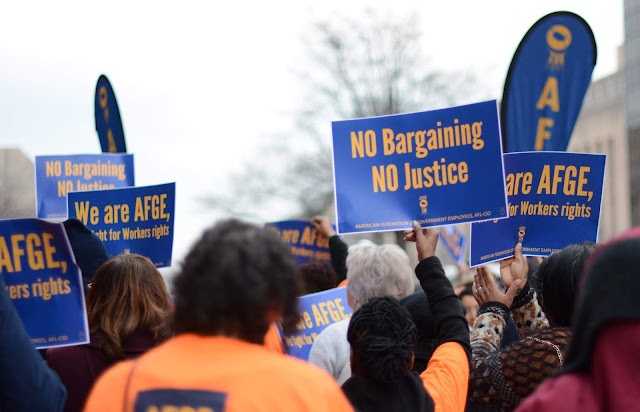 After months of anti-union proposals and hostile behavior at the bargaining table, Department of Education management told AFGE in March that it would not negotiate and would instead implement its own terms. The so-called "collective bargaining agreement" imposed by management is an illegal management edict that guts employee rights, including those addressing workplace health and safety, telework, and alternative work schedules. President Trump issued three executive orders in May that largely aimed to expand Education's anti-union proposals governmentwide. In August, however, a federal judge ruled in a lawsuit first brought by AFGE that the administration's actions violated the U.S. Constitution and laws providing checks and balances in the federal government by attempting to deny more than 2 million federal workers their legal right to representation. "It is difficult to avoid the conclusion that this Administration as a whole does not take seriously its bargaining obligations under the Statute, evidenced by the issuance of the illegal, anti-bargaining Executive Orders together with the growing prevalence of bad faith bargaining behavior across federal agencies," the senators wrote. "Secretary DeVos' anti-worker crusade has not slowed down one bit since the FLRA's ruling and the judge's decision – if anything the department is more resolved than ever to keep denying workers their rights," Cox said. "I urge Secretary DeVos to order her management team back to the table so we can negotiate a fair, just, and legal contract, which all employees deserve." ⏩ The American Federation of Government Employees (AFGE) is the largest federal employee union, representing 700,000 workers in the federal government and the government of the District of Columbia.